Vol. 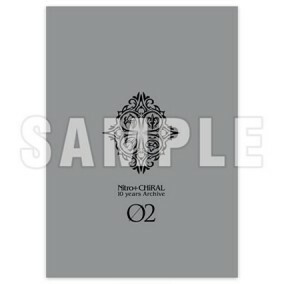 2 of the Nitro+CHiRAL anniversary book! Volume 2 of the 3 volume "Nitro+CHiRAL 10 Years Archive" anniversary book series, chronicling the 10-year history of Nitro+CHiRAL! This second volume focuses on sweet pool and Dramatical Murder, including illustrations from game packages and drama CDs, as well as supplementary art included in magazines and with merchandise, creating the most comprehensive visual guide to date. In addition, an array of guest artists have contributed illustrations and congratulatory comments, making it chock-full of new material never before seen! It also documents a round-table discussion with scenario writer Gen Urobuchi, and other staff who have been there since the beginning and continue to play a major role in the company. Who knows - now that 10 years have passed, they may even be able to talk a bit about the top secret development process!? A book you can enjoy as both a visual chronicle and an historical record.